As you tuck into Christmas dinner, spare a thought for the Brussels sprout grower, writes Michael Kelly. IN THE RUN up to Christmas this year, perhaps spare a thought or two for the growers that will put the veg on your Christmas dinner table. There are only one or two vegetables that suffer from what you might call hyper-seasonality, where we really only eat them at one, very specific time of the year. Pumpkins are one, with the vast majority of the crop consumed at Halloween. Brussels sprouts are the other, with most people eating them only on Christmas Day (and the rest avoiding them like the plague). This intense seasonality puts these growers in a vulnerable situation – since they have to sell pretty much their entire crop at that time, the buyers of their crop have them over a barrel. The sprout growers have been nurturing their crop since May of this year and they are on the shelves now. It’s a tricky and labour intensive crop to grow. One would expect to have to pay a premium for such a seasonal delicacy but in fact, over the last number of years supermarkets have used Brussels sprouts (and other Christmassy veg like carrots and parsnips) in aggressive price promotions. In recent years the price of 500g of sprouts dropped as low as 7 cent as part of dramatic supermarket price wars. Mainly these promotions are about getting you in the door so you will stack your trolley with luxury mince pies, Christmas themed napkins, selection boxes and flavoured gins. Supermarkets insist that they fund the cost of veg promotions rather than forcing price reductions on their suppliers. They tell the growers that these are short-term promotions designed to build the market for a particular vegetable. Consumer groups line up to say, sure don’t people have a family to feed, and isn’t it great we have access to healthy food at rock bottom prices? All of these arguments are short sighted. In reality, promotions set a long-term price expectation that is never properly rectified. While that might seem like a good thing for consumers, in the long run it just means more growers leaving the industry and more imports replacing Irish produce on shelves all year around. As consumers that gives us less choice and less access to local food that’s at its freshest and most nutritious. 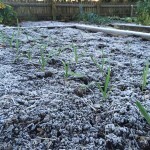 A question was asked on Twitter recently: why is GIY talking about an issue like this when we should be focused on getting people to grow their own veg? It’s a valid question. We are absolutely about getting people to grow some of their own veg. We helped over half a million people to do so this year in Ireland and the UK. But the reality is that most GIYers will grow only a small percentage of the food they eat and buy the rest of their food in the supermarket. And that’s ok.
We believe they will be more conscious consumers as a result of their food growing, and they will seek out more seasonal, local, healthier food. They will value their food more, and understand the work that goes into growing it. So, in a way, our main aim is promoting food ‘empathy’ and growing some of your own food is a means to that end. With that food empathy comes a realisation that downstream there is in fact a ruinous cost to cheap food. A cost in terms of Irish jobs, our food security, our health and the health of the planet. So, as you tuck into your Christmas dinner, spare a thought for the Brussels sprout grower. Let’s hope they have a bumper season and get a fair price for their hard-won produce. Early maturing sprout varieties are now cropping. Pick sprouts as soon as they are ready to eat (while still hard and firm and before they open out). 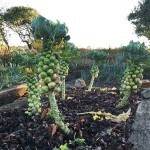 Pick the sprouts from the bottom of the stem first and then move upwards. To harvest a sprout simply snap off by pulling downwards. The leaves at the top of the stems can be cooked like spring greens – very tasty they are too. Do not “Irish mammy” the sprouts by boiling the devil out of them for 20 minutes. Blanch them in boiling water for just one minute and then fry them in some oil with a sliced clove of garlic and some almond flakes. Season well and add some olive oil before serving. When harvesting, don’t try and pull the leek out of the soil by the top as you would a carrot – their roots are surprisingly fibrous and strong. So, use a fork. 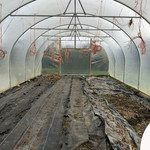 Winter varieties can stay in the ground until needed, although in a very harsh winter you might need to use them up – constant freezing and thawing will eventually turn them to mush. 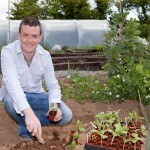 JB Dubois is Head Chef at GROW HQ in Waterford. The advantage of the ‘curry paste’ is that it is very quick to make and it keeps up to one month jarred in the fridge. In a small frying pan on medium heat toast the cumin seeds, coriander seeds and the desiccated coconut until golden and fragrant. Add the rapeseed oil and the chopped garlic, turn down the heat and leave cook for 2 to 3 minutes. Then add the turmeric, cayenne and smoked paprika. Blitz in a food processor to a paste and add the vinegar. Peel and roughly dice the root vegetables. Place them in a large roasting tray, scoop some of your amazing curry paste in the tray add a pinch of sea salt. Massage the paste onto the vegetables. Cover with tin foil and cook in the oven at 160℃ for 45 minutes to 1 hour, until al dente. Take off the foil and roast the vegetables for a further 15min. Add the pre-blanched green beans and the chopped kale, stir though and serve with a sprinkle of toasted seeds. If you like a more substantial meal, you can add 100g of lentils. My favourite way off using lentils is simply to soak them 48 hours previously in water and serve them raw in a salad or warmed through in a curry.